Haunting sounds evocative of another continent drifted around the busy streets, bringing a touch of the Orient to Canada’s capital city. Strumming a curious-looking stringed instrument, the woman in the Japanese kimono seemed oblivious to the people scurrying past. 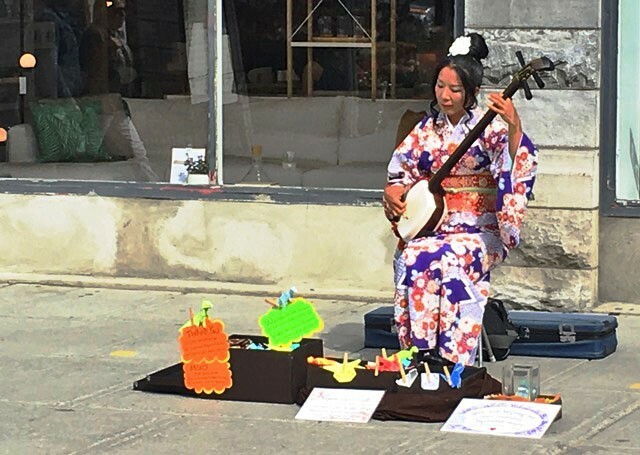 She sums up Ottawa; a colourful mash-up of diverse sights and sounds in a historic setting. I was here for a week, part of a group of 14 UK Travel Bloggers spread out across the country, to celebrate Canada’s 150th birthday. Staying at the uber-cool Andaz Ottawa Byward Market put me slap bang in the heart of the city’s bodacious beating heart. On the evening of my arrival, I’d seen dozens of cool ‘hipsters’ ascending to the hotel roof bar to enjoy a Saturday night of cocktails and chat with one of the best views of the city spread out in front of them. Fortunately I had a very similar view from my bedroom. Dominating the skyline, the Parliament Building is the democratic symbol of this relatively young and very exciting country. On my first day out, Jantine Van Kregten, Director of Communication for Ottawa Tourism, took me out to Ottawa’s Farmer’s Market at Lansdowne Park. 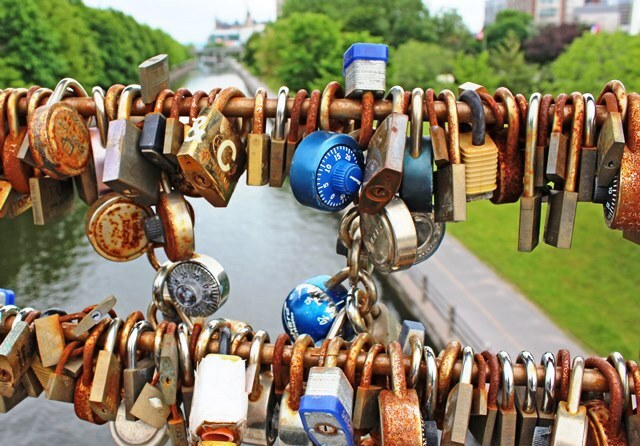 We stopped on the way to see the locks on the bridge over the famous Rideau Canal, reminders of love and the bane of city officials as they weigh down the bridges around the world. 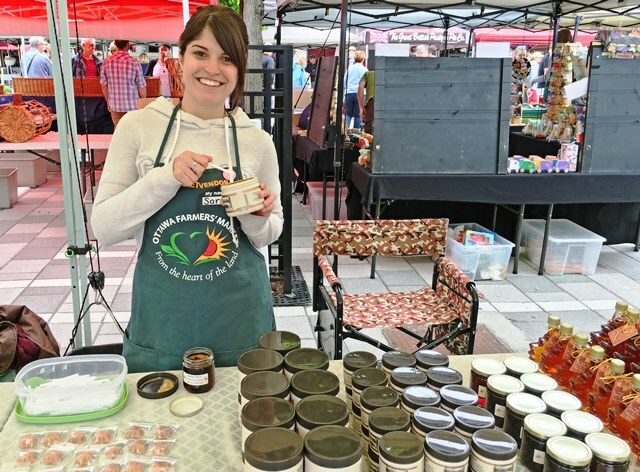 Lansdowne Farmers’ Market is a part of the Savour Ottawa initiative that bring together local farmers and producers with chefs and consumers. ‘Savour Ottawa works to develop and promote Ottawa and area as a premier, year-round culinary destination, with robust offerings of local culinary products and experiences for both locals and visitors.’ It’s everything you’d hope from a Canadian market, showcasing delicious produce, including fresh asparagus huge tomatoes, crispy apples, luscious rhubarb, early strawberries, artisan bread and cheeses, meat, pies, honey, spicy mixes and, of course, maple syrup in various guises. The Aberdeen Pavilion, built in 1898, is now a huge exhibition space. There was a Latin American festival going on in another hall, with salsa dancing lessons and lots of laughter. The following day I went on a boat trip on the Rideau Canal. In spite of torrential rain, I thoroughly enjoyed drifting along the canal, learning about its history from our guide, who injected plenty of humour into his informative spiel. Being the capital of Canada, Ottawa has a world-class collection of museums and art galleries. You can read about the Canadian Museum of History and the National Gallery of Canada here. One of my favourites was the Bytown Museum. It’s housed in The Commissariat, the oldest stone building in the city, beside the lower locks of the Canal. 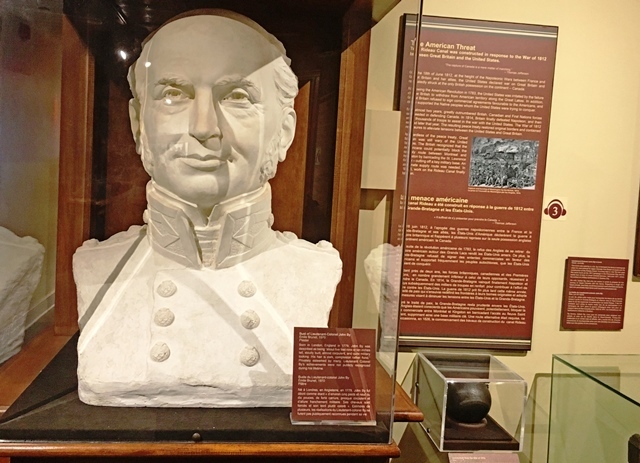 An eclectic mix of exhibits tells the history of Ottawa and how it became the capital of Canada. There’s a copy of Queen Victoria’s Proclamation for uniting the Provinces of Canada, Nova Scotia and New Brunswick, into one Dominion under the name of Canada. It’s dated the 22nd of May, 1867 . Bytown, the original name for Ottawa, was clearly a bit of a ‘wild-west town’ in its early days, notorious for the riotous behaviour of the European settlers who came for the lumber trade. 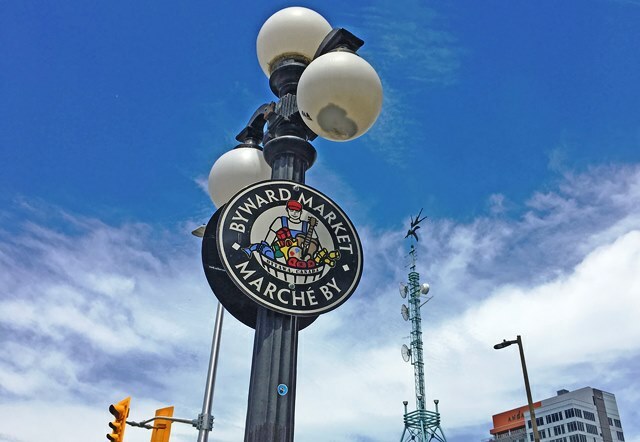 I spent a lot of time exploring Byward Market neighbourhood, a popular hub for bars and restaurants, excellent foodie shops and cafes, performance artists and people watchers. I met up with Canadian travel blogger Cindy Baker (check out her blog My Travel Bliss which has a lot more on Ottawa), who showed me round. I especially loved the indoor market, originally built to provide supplies for the lumber trade. Suspended over the stalls is very quirky sculpture, McClintock’s Dream by Hungarian artist Victor Tolgesy. A lumberjack in a plaid shirt lies below a giant cloud, dreaming of all the thing he will buy from the market when he gets back home to Ottawa. 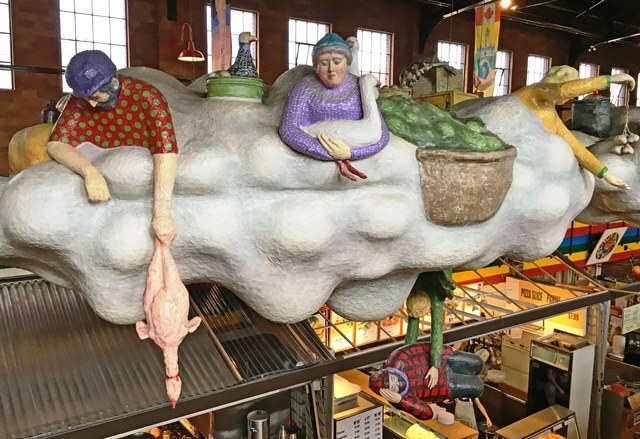 Hanging over the cloud, vendors tempt him with strings of sausages, poultry, garlic cloves, apples and much more. During my week in Ottawa I did so many more things, including a C’est Bon foodie tour of hipster Hintonberg and a bus tour of the city, ate out in some of the best restaurants in town including Play, Food and Wine, listened in on politicians exchanging gossip and mingled with the beautiful people at the opening of a new bar. I admired street art in lively neighbourhoods, watched the Changing of the Guard at the War Memorial, had a guided tour of the Parliament Building and watched the sun go down over the Rideau River. Keep an eye out for my article on the food and drink scene. 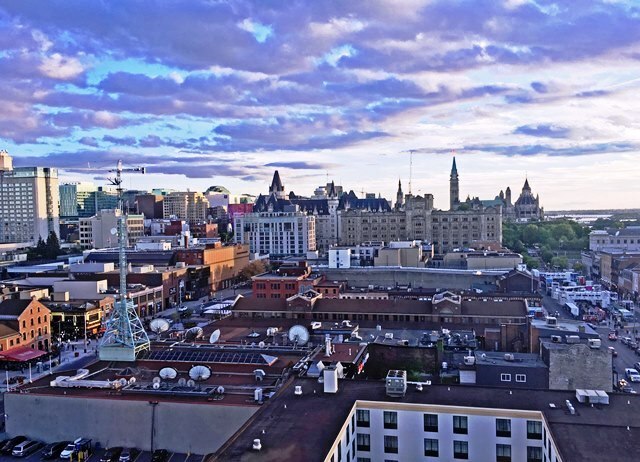 If you’re going to Canada, make a date with Ottawa; you’ll be seduced by its friendly charm, low-key sophistication, impressive architecture and exuberant joie de vivre. Visit Canada Keep Exploring to discover more about where to go and what to do in Ottawa. Return flights from Gatwick to Toronto from £346 (October 2017) and £349 (May 2018) per person with Air Transat. 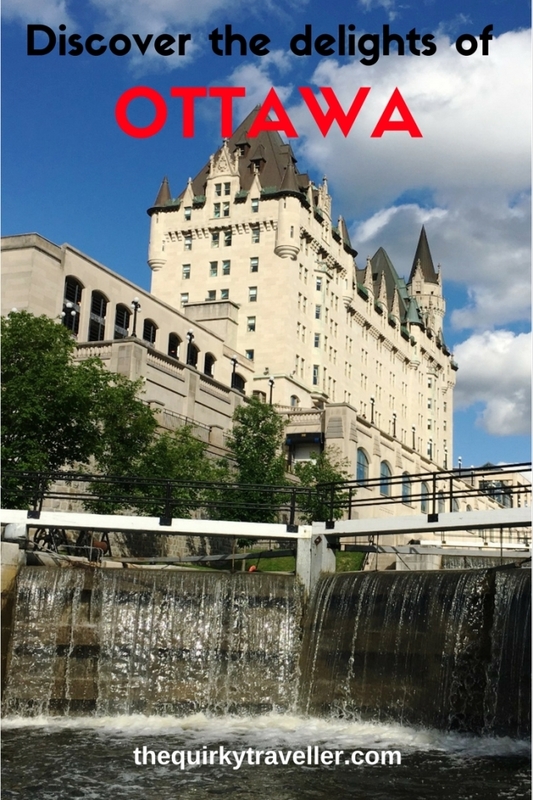 Canadian Affair offers an 8-day package tour Ontario Taster Holiday which includes 2 nights in Ottawa. Sponsor Post: Many thanks to Destination Canada, Air Transat and Ottawa Tourism for sponsoring my visit to Canada. It was a pleasure to explore more of Canada, a country of unforgettable experiences. 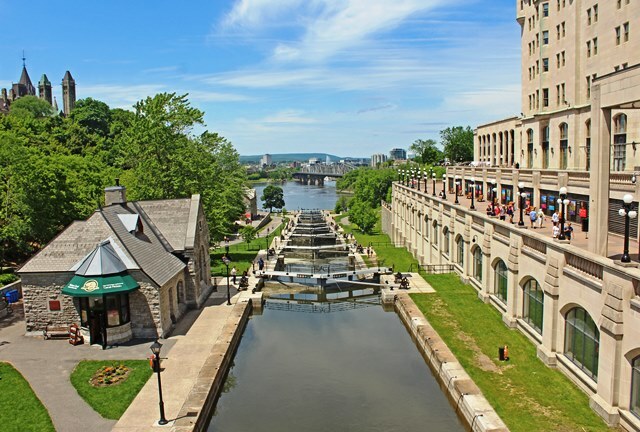 The Rideau Canal looks like it’s well worth exploring during a trip to Ottawa. I hear that the area around the Byward Market is the go to place for food and drink. Any restaurants or bars that really stood out to you? A Great read Zoe – really enjoyed that! Its been a while since i was last there – hoping maybe next year. It all looks wonderful! Starting a visit to a new city with the local farmers’ market is a great idea – a great insight into the local people and food scene. I did the same in Saint John. You always meet such interesting people and taste some fabulous fare. Thanks Nim – I was SO impressed with Ottawa and hope it gets more overseas visitors as it really is a world-class city. You’re so right Kat – food is a really good way to learn more about a place and a farmer’s market gets right to the heart of it. Loved your article on St John – another Canadian gem! Zoë, I so enjoyed spending time with you in Ottawa and pointing out some of the fun spots in and around the region. This year (2017) is certainly a special one as we commemorate the 150th anniversary of Canadian Confederation all year long but there are also great reasons to visit in 2018 – our winter festival Winterlude celebrates its 40th edition in February, a new self-drive boating company called Le Boat comes to the Rideau Canal in May, we launch a light rail transit system (subway) in 2018, and many of the museum enhancements and openings that took place in 2017 will truly hit their stride in 2018 – for example, the Canada Science and Technology Museum opens its doors in November 2017 but will still have that “new museum smell” in 2018! Exciting times indeed! Wow, what an exciting year you are having- and more to come next year! Hope you saw your cameo role in the video 😉 Thanks so much for showing me round and I do hope to return one day to see more of your lovely city. 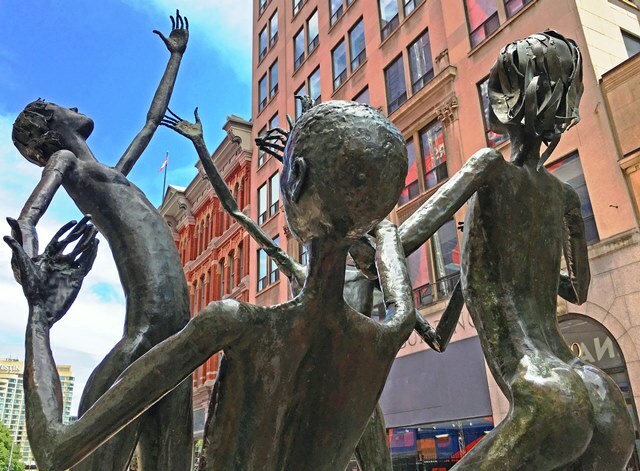 Wonderful article capturing the spirit of our city. It was great fun showing you around and always enlightening to see your city through the eyes of a visitor. The beautiful fall colours are just starting and we’re ready to welcome visitors for the season and year round! Thanks so much for taking time out to show me round. It was so good to have a local with insider knowledge to share. You live in a fascinating city with a lovely relaxed vibe that should be higher up on the tourist map! That canal is a very impressive engineering sight. It would be a challenge to build today – must have been very difficult to do it in 19th century Canada. 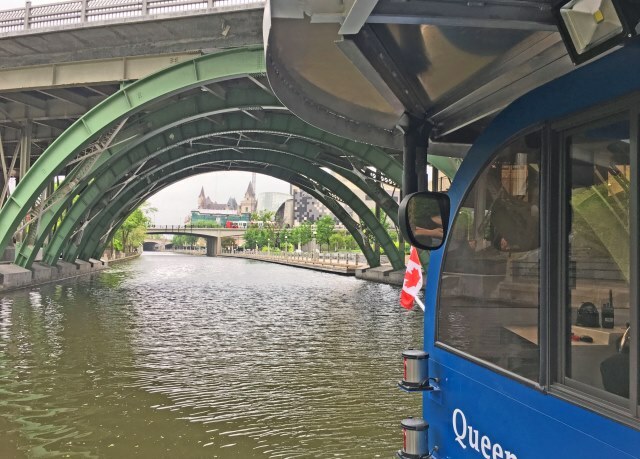 I really enjoyed Ottawa, for a capital city it is very easy to get around the centre – I also enjoyed theglass art gallery with that enormous spider outside. Thanks for your comment Heather and I can see why you enjoyed Ottawa. So much to offer the visitor as well as locals. Great city to read about Zoe because it’s a place I don’t hear much about – looks very clean and elegant!